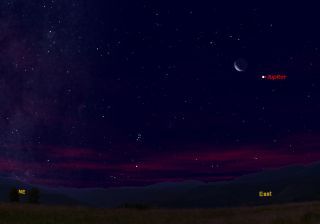 Jupiter and the Moon will appear together on June 26, 2011, as shown in this sky map. Early risers on Sunday (June 26) morning, given fair weather, will be treated to a lovely celestial tableau in the eastern sky as the planet Jupiter hovers below and to the right of a slender waning crescent moon. Although moon and planet will not be particularly close, they will be by far the two brightest objects visible in the predawn sky, and will command instant attention wherever the sky is reasonably clear. The sky map of Jupiter and the moon here shows how they will appear on Sunday. Jupiter rises about three and a half hours before the sun — around 2 a.m. local daylight time — when at magnitude -2.2, it outshines everything but the moon. On this astronomers scale, smaller numbers represent brighter objects, with negative numbers being the brightest of all. Jupiter is currently in the constellation Aries, where it will remain until it briefly crosses over into the adjacent zodiacal constellation of Pisces in early December. In the days and weeks to come, Jupiter will rise progressively earlier as well as appearing to noticeably brighten as Earth speeds along its orbit, closing the distance between our two worlds. Sunday morning will find the moon 23-percent illuminated and positioned five degrees from Jupiter. Your clenched fist held at arm's length measures 10-degrees, so on Sunday morning, Jupiter, shining like a brilliant silvery "star" with a steady glow, will stand about half a fist below and to the right of the moon. The view will likely be even more enhanced by the effect of "earthshine" on the moon. This light reflected from the Earth allows you to see the full globe of the moon, its darkened portion glowing with a bluish-gray hue interposed between the sunlit crescent and not much darker sky. This vision is sometimes called "the old moon in the young moon's arms." Leonardo da Vinci was the first to recognize it as earthshine. The Earth's light of course is reflected sunlight, so earthshine is really sunlight that is reflected off Earth to the moon and then reflected back to Earth. Viewing with binoculars will bring out the earthshine effect more than if viewing with the unaided eye, and will impart a three-dimensional effect to the moon. In some binoculars, you might be able to fit both the moon and "Big Jupe" in the same field of view: a sight well worth rising early to see!